With the Z5, all the upgrades that others sell as extra cost options are integrated into the design at no extra cost. We pioneered the low profile front entry pod harness over 30 years ago, and we’ve been improving it ever since.Configure your harness with the Z5 Order Form. 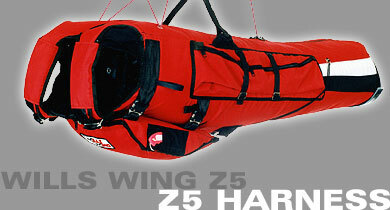 The standard exterior of the Z5 is constructed of 420 diamond rip-stop nylon. This fabric provides exceptional abrasion durability, high tear strength, and excellent UV resistance. The interior cloth is 400 denier Antron. Antron is strong, durable, and has a smooth, non-abrasive finish. Sandwiched between these two cloth layers is a layer of ¼” thick Volara foam. This high-density foam increases the long-term comfort of the harness and resists compaction. The harness features two Click-Lock buckles across the chest. These buckles feature an anodized aluminum body and stainless hardware. Top quality YKK zippers are used throughout the harness. You have a choice of four stock body colors, all in 420 600 denier diamond rip-stop nylon: black, royal blue, red and charcoal (silver). These can be combined with your choice of any available wedge color, or split the wedge with two colors (see Z5 harness color selector). Custom body colors, including a split body color combination, are available as an extra cost option. Please see the harness order form and the Ordering and Sizing Guide for more information on color choices and options. Both the top and bottom entry zippers are secured with Velcro and user replaceable. The bottom zipper features an emergency egress handle that can be used to assist the pilot in the event of a zipper failure. The boot skid abrasion protector is also user replaceable. The Z5 comes standard with a hook knife pouch and a zipper-attached, removable radio pouch. The radio pouch is designed to fit the majority of compact handheld radios on the market today. Because it’s removable it can be left on the radio at all times allowing ready use both on and off the harness. The Z5 is a full featured harness, on which we offer custom sizing when necessary, customer’s choice of harness mains length, and customer choice of 4 standard body colors and a wide range of accent wedge colors, for no extra charge, at the standard price of $1150.00 retail. These harnesses are built to the customer’s individual order, and the $1150.00 price reflects our cost of doing that. If the customer requires custom work beyond custom sizing, the cost for that additional custom work will be quoted and added to the $1150.00 price. We also make inventory harnesses, in batch production, at a lower cost to us. We pass these cost savings along to the customer by offering inventory harnesses at a reduced retail price of $1000.00. An inventory harness is a harness which is ordered out of our inventory, from the inventory harness list. If the list indicates that the mains have not been fabricated at the time the harness is ordered, the customer may specify custom length for the mains at no extra charge. If the mains are already attached, this is not an option. The harnesses listed on the inventory harness list are the only harnesses that qualify for the $1100.00 price. A harness built to customer order, whether or not it requires custom sizing, is always priced at $1150.00. Please do not confuse “stock size” with inventory price. The table below relates Wills Wing harness sizes to individual body measurements. These are the actual ranges for the Z series models and can be considered approximate for the Flylight Deluxe model. XSmall 47 1/2" 5'1" 37-39"
Small Plus 50 1/2" 5'5" 38-40"
Medium Plus 53 1/2" 5'9" 39-41"
Large Plus 56 1/2" 6'1" 40-42"
Xlarge Plus 59 1/2" 6'5" 40-42"
The armpit to floor measurement is an important sizing parameter. With arms held 30 degrees out from the body and the shoulders held level, measure from a ruler held level in the armpit, to the floor. Measure your chest and hips with a light shirt only. If you want to specify non-standard fit (tight for better aerodynamics or loose to accommodate extra bulky clothing) indicate that separately. Note that a loose harness fit may compromise comfort and increase pressure rotating upright to landing attitude. If you have owned or test fit a Z1, Z2, Z3 or Z4 please include the harness number or enough information for us to identify the harness size. Wills Wing harness main support straps are sized to hang a properly fitted, standard harness 1″ to 2″ above the control bar base tube of any WW glider, when the pilot attitude adjustment is slightly head down. That corresponds to a top of base tube to hang loop dimension of 55 inches. Variations in pilot size and individual harness adjustment preferences change the hang distance above the base tube with standard mains. We strongly recommend that you size your harness mains to fit a standard Wills Wing glider hang loop. Shorter main lengths are available on request, but they increase back compression and discomfort. Sizing Modifications (LENGTH MOD, CHEST MOD) are in inches and reflect changes made for custom harnesses. For example ‘ XL, Length +3, Chest -2 ‘ would be best for a tall, thin person. I just wanted to let you guys know that I have received and flown ( a lot!) my new Z-5 via Doug Campbell and I am extremely pleased! Great functional design, storage, quality, appearance, adjustments, and best of all the flying comfort! This is one sweet harness! Thank you very much! I love dealing with Wills Wing because your company is the very best. You have the best product with impeccable service and your dealers are awesome. Thanks again! I finally flew with my new WW harness at a big Memorial Day weekend fun fly at Austinairsports.com!! The harness fit is P-E-R-F-E-C-T!! and works very well. I am not sure if I still have a copy of my harness order. Do you still have my harness order information that you can keep on file? If I need another harness I would like one E-X-A-C-T-L-Y like this one. Next week we will be at Edinburg,TX for a week of flying….